What did your dog do today? Our highly trained crew is ready to show your dog a good time. Scroll down to find out more about our excellent staff. I'm Josh! I started Canine Adventure because I saw a need for local dogs who need engaging, fun activities to participate in while their humans are at work. They deserve a professional who is experienced, talented and skilled, and adept at showing them a good time consistently. That's what I seek to provide with Canine Adventure! While I'm not running dogs and the business, I love to cook (and I'm pretty good at it), work on my motorcycles, keep my garden of fruit trees in order, and play a bit of music (which I'm not so good at...). Hi! I'm Melissa! I began working at Canine Adventure in March of 2011. I've always had a love for dogs, and as I got older found myself gravitating towards working with animals. Attending school at George Mason University in Northern Virginia, I even passed the time between classes working for a dog walking service! With a company like Canine Adventure it's not hard to get up every morning, excited for what the work day will bring. I like to think of each client as an extension of my family, so I strive to give each dog the best, most positive experience they can have; be it the Adventure Walks, a walk through the neighborhood, or even pet sitting when their owner is out of town. It certainly makes it easier when you love your job! When I'm not hanging out with your furry best friend, I enjoy going to concerts, watching movies, or just curling up with a good book or graphic novel. Richmond is such a unique and wonderful city, and on my free time I try to make the most of it! I love exploring new areas and neighborhoods, trying new restaurants, and, of course, hanging out along the James! My name is Brittany and I was born and raised in Springfield, Virginia just south of DC. I have been lucky enough to have been working with animals since 2007. My first job was working at a doggie daycare, but I have since worked in veterinary medicine as an assistant for the last 7 years. I moved to Richmond in 2010 to pursue my degree in fine arts and graduated from VCU with a bachelors degree in Craft/Material studies with a focus in fine metal and glass in May 2014. I have always loved working with animals and could not imagine my life without them! Nothing is more rewarding to me than connecting to an animal while helping them build confidence and watching them grow, which is why Canine Adventure is so perfect! I couldn’t imagine a better way than spending my days than outside, surrounded by puppy love. When I’m not working at Canine Adventure, I am more than likely drinking coffee and hammering away at something copper or sterling silver in my studio. They call me Danny! At the suggestion of folks that knew of my love for all things dog, I checked out Canine Adventure and was devastated to know a dream job actually existed and I wasn't working there. I was given the opportunity to try the most different and fun occupation I could come across and be saved from continuing to work at an unfulfilling one. I get to spend my days letting dogs be dogs, and their humans rest easier with their pups tuckered out! Outside of work, I take my relaxation time very seriously with friends, watching movies, reading, petting other peoples' dogs, riding my bike and planning to start my diet tomorrow. My name is James, and I manage the Charlottesville branch of Canine Adventure. Before joining this amazing company, I was living in Charlottesville and hiking the beautiful trails here every day. However, my world seemed empty without some pups to share it with, so I started bringing my friends' dogs along on the hikes. I had just started to think I could turn my passion into a business when I realized that my dream already existed in Canine Adventure. I moved to Richmond, learned a great deal from their excellent handlers, and one year later I am back in Charlottesville with a team of my own. Despite the many changes in my life over the past year, I still have a passion for hiking with dogs, and still can't believe that I get paid to do it. Come get your Adventures, C'ville! Hi, I'm Kasey! I started working for Canine Adventure in September of 2014. After working in domestic management for over 8 years, I was looking for a career change that kept me independent, active and on my feet, but still had me working closely with clients. As a lifetime animal lover, Canine Adventure seemed like the perfect fit--and it is! I really enjoy waking up every day and working with furry four legged friends and I love the smile on a dog's face when they're on their Adventures and walks. It's truly empowering. Combined with my love for all things outdoors, I can't think of a better career move. I grew up in Baltimore, Maryland and attended The University of Notre Dame of Maryland. I moved to Richmond in 2009 and I absolutely love it here; all the best of a small town and a big city, and by far one of the most animal friendly cities I've ever experienced. When I'm not running with the pack, I love checking out live bands, listening to records, playing music, trying exotic new foods, reading, and camping, hiking and soaking up the seemingly endless natural beauty of the state of Virginia. Oh, and hanging out with my FIVE awesome cats. Hi, my name is Jane. I was mostly raised in Virginia Beach, but was living in far Northern California (in a small town next to a big mountain) before I moved to Richmond -- for many reasons, but also for the heck of it -- in November of 2016. I tended bar in California, but I find I prefer the company of animals. I am owned by two Pomeranians: a bald senior gal with attitude named Opal, and my stalwart handsome fluffball son named Ludi (short for Ludwig, which he only hears when he's in trouble). They are my favorite things in the world, which is a sentiment that absolutely extends into the work I do with Canine Adventure! In my free time, I like to read, take photos, hike, do an assortment of arts and crafts, enjoy games and movies, travel, eat, and nap with my dogs. I also enjoy candlelit dinners and long walks on the beach. I look forward to meeting your furry children! Hi! My name is Beth. I absolutely love working with Canine Adventure and getting to help dogs be dogs and have the most fun. I’ve worked for a dog boarding facility for 4 years which helped me learn a lot about dog behavior, but I wanted to do something more “fun” involving dogs. I graduated from VCU in 2014 with two degrees: photography, and gender, sexuality, and women’s studies. I love that I can combine my interests with dogs and photography and get awesome pictures of dogs at the river! When I’m not hiking with dogs, I am hanging out with my own two dogs, a pit bull named Ya Ya, and a chihuahua named Lavender, and my two cats, bell hooks, and Sam-Soon. I can usually be found with a pile of my animals laying on top of me, watching the Mindy Project or Parks and Rec. Hi, I'm Brian. I like hiking and I like dogs. I like hiking with dogs. to say this job has been a good fit for me is a tremendous understatement. When I'm not hiking with dogs, you can most likely find me listening to music and podcasts, reading, having dance parties in the living room, and playing hide & seek. Hiya! I’m Emily and I am a lifelong animal lover. Much of my youth was spent as a bookworm in a small town in the Shenandoah Valley where I probably took all that natural beauty for granted. After graduating from William & Mary, I worked mostly in publishing. It had its moments, but for a decade the most rewarding and wonderful part of my week has been volunteering at the Charlottesville-Albemarle SPCA. Since 2009 that has involved walking dogs with my husband every weekend; we don’t consider our shift over until we get every single dog out for a walk or a romp in the park! I’ve learned so much there and, of course, I’ve added 3 dogs to my pack along the way (my cats have yet to forgive me for this). When I’m not attached to a leash, you might find me in my garden, workshop, or hammock! Hi, I’m Ethan! I joined the Charlottesville branch of Canine Adventure in March of 2016. I recently had the opportunity to re-evaluate my career path, and two things became clear to me: I needed more dog time and more outside time in my life. Canine Adventure is the perfect avenue for accomplishing these two goals. Dogs have played an integral role in my development, and I always seem to learn just as much from them as they do from me. I truly believe it’s important for all animals to live a high-quality life, and I really enjoy seeing a pup’s face light up when they get the chance to go outside on a big Adventure. I look forward to forming long-lasting relationships with my 4-legged and 2-legged clients. When not working, I can be found doing something outside. I love whitewater kayaking, skiing, backpacking, and hiking. My wife and I currently don’t have a pup of our own, but I anticipate that will be remedied quickly after spending time with all the great shelter dogs! Hi, my name's George. I've lived outside of Richmond my whole life. I've been around dogs since before I can remember and I'm the type who could never live without a fluffy companion of some sort. I currently live with two English Mastiffs who are both completely hilarious. I worked for three years at a dogie daycare/ boarding facility and absolutely loved working with the dogs. Working in a kennel that routinely has 30 or 40 dogs in a yard together for eight or nine hours gave me a good amount of experience in dog socialization and behavior. When I found out about Canine Adventure I knew that it was something that I wanted to be a part of. I can't wait to take your dog out and show it a great time! I spend my downtime reading fiction, or browsing the internet. I picked the perfect dog because she loves nothing more than laying around all day with me while I read. Hi, I'm Harmony! I've wanted to work with Canine Adventures since I heard about all the things they offer. I especially love that shelter dogs can be sponsored to go on walks and get to spend some much-needed time outside of their cages. I'm glad I can be a small part of excitement for a dog in need of a forever home. Canine Adventure shares my sense of values, and I really agree with this company's goals. 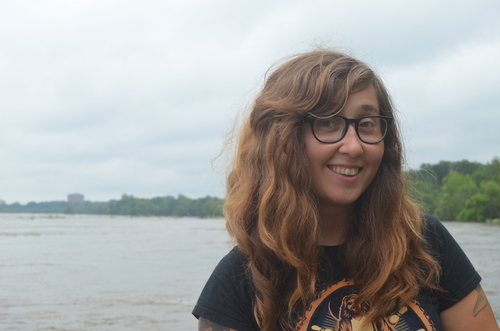 I returned to Richmond in August after spending eleven months traveling around the world. What an amazing time! I also work as a dental hygienist part-time. In my free time I love being outside, walking through the woods. I also spend time reading, hanging out with friends, and thinking up new recipes to cook. I grew up on a farm in upstate NY and have been rescuing animals in need for as long as I can remember (cats, dogs, an orphaned squirrel, injured rabbits, a loon wrapped in fishing line… the list goes on). My childhood dream was to become a Veterinarian and I started down that path until I actually earned my undergraduate degree. At that point, it made good common sense to bail on my aspirations, move to Virginia and jump into the corporate workforce. After more than a decade at a desk job, however, I realized it was time for a lifestyle change so I officially retired from the rat race. I pursued a job with Canine Adventure because I admire the work they do and knew it would be a rewarding and fun experience. For me, spending time outside, being active, and building relationships with new 4-legged friends is the ultimate dream job! While I’m not hiking/ running/ playing with my canine buddies, I’m hiking/ running/ playing with my kids (of the 2-legged variety), gardening (through sheer persistence to compensate for my lack of green thumb), volunteering with animal rescue groups, and always trying to learn something new (at the moment, it’s Mycology and coding). I know first-hand how hard it can be to make sure your pets are getting the exercise, stimulation or break they crave during the long work week. I’m genuinely thrilled to be able to provide that service for you. Hello! I’m Louis, I’m originally from Alexandria, Virginia where I lived with my family and my favorite lab, Willow. I loved taking her to the river and letting her run and swim in the water. While I lived at home, I worked as a kennel tech for an animal hospital for over five years. I loved the work but then I moved to Richmond to further my education. I wanted to continue working with animals and that's when a friend told me about Canine Adventures. I knew right away that I wanted to work for this company. It’s hard to resist a job that allows you to get outside and play everyday, especially with some canine friends. When I have some free time I try and spend as much time as I can outdoors. I am a water enthusiast; I can spend all day playing in the river or surfing in the ocean. I can never get enough of it. I also enjoy hiking and just getting into the woods. When the day is over, I find joy in having some down time and hanging out with some good friends, furry ones included. Hi! My name is Madeline. I've lived in Richmond on and off since 2010, having also spent some time on Ocracoke Island, where I grew up. I'm thrilled to be back in the city and working with Canine Adventures! I have lots of experience pet-sitting and I've always loved being around dogs. When I found out about Canine Adventures, I realized there couldn't be a better way to enjoy this beautiful place and it's incredible parks than by getting to play outside with fun-loving pups! I love that with this job, I'm constantly learning new things about animals. I’m looking forward to working with your furry friends on fostering and reinforcing confidence and good behaviors. When I'm not enjoying time with your pets, I'm usually cooking, reading, or spending time with friends and family. I don't have a pooch of my own right now, but I love playing with my little rescue cat, Puff. Hello! I am Tim. My own dogs had long been the focus of my life, so thinking about it, there is no surprise that taking care of other peoples dogs has now become the center. I enjoy bringing the same caring and sense of responsibility and lavishing the same attention and affection that I do for my own dogs to my more temporary canine companions. In my spare time, yep, I am hiking or running the trails or just hanging out with Guinness and Sophie, my dogs. Hello there! I'm Sarah. Growing up, there was never a time when I didn't have pets. From dogs and cats, to goats and chickens, I can't imagine my life without a furry friend by my side. I'm so lucky to work for Canine Adventure, where I can be with them all day! I also intern at 2SpeakDog, where I help out and learn a lot about dog behavior and obedience skills. When I'm not working or attending classes at 2SpeakDog, you can usually find me going on adventures with my own dog, Flash! Our favorite places to hike and explore are my parents farm and at the river, but sometimes you can find us cuddled up on the couch watching Game of Thrones. Hey there! I'm Stephanie, and I'm stoked to be a part of Canine Adventures! I love dogs and cats, and I'm lucky to have had a father who showed me the importance of loving and taking care of animals. To be able to turn this into a career is just awesome and truly a life long dream of mine. I have a chihuahua-corgi mix name Icarus, a border collie named Kona, and a sweet old black cat named Ray Charles Jr. I am so lucky to be able to learn from them everyday. They keep me on my toes constantly and I wouldn't have it any other way! My name is Veronica and I am so excited to be apart of the Canine Adventure team! I am a native of St. Louis, Missouri and I moved here to work. All I want to do is work with animals. I have worked with dogs and cats for five years at different dog kennels and volunteered at the city humane society in St. Louis. My goal in life is to work with marine mammals in settings that are educational to allow people to get a better understanding of the wonderful creatures that call our waters home. Outside of getting your pups a fantastic workout, I work part time at Maymont Parks as an animal keeper in the Children's Farm. I hope to give dogs a great time outside of home and give them new experiences and great adventures. My name is Amadi and working with Canine Adventure has been a dream come true. Ever since I was a kid I knew I wanted to work with animals. We have always had a dog growing up and I was always the kid looking to catch and feed stray dogs, so when I got the job working with this great group of people I was ecstatic! I get paid to do what I love, which is training and spending time with dogs! When I turned 18 I started working at a doggy daycare and fostering for a local rescue and my life changed completely. We moved from the city out to Goochland for more acres and a better house and land for our many fosters. I've had dogs with fear issues, extreme anxiety, people aggression, you name it, and we were able to work with them and help find AMAZING homes. I have been fostering now for about 8 years and I always want to have a foster dog in my life. When I'm not hiking with your pups or mine, I love to relax with my furry family and watch a good scary movie. Luckily for me, I'm always in good company! Jenny moved to Richmond, VA from Ann Arbor, MI. She currently lives in the Near West End with her husband, Olivier, and cat, Claire. Growing up in the Midwest, she attended Purdue University and earned a Bachelors of Science with a dual major in Agriculture and Wildlife Science. 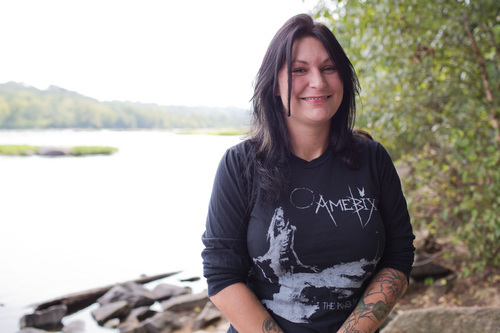 Throughout college she worked at Oubache State Park. For the last eight years she has been employed by the University of Richmond. In her free time Jenny loves to read, knit, and be outdoors. I moved to Richmond in the summer of 2017 and absolutely fell in love. Not only is it an amazingly active and dog-oriented city, but I have been so lucky as to find my dream jobs. I also work at the Richmond SPCA as a Behavior & Training Associate. I get to spend my days hiking and hanging out with dogs AND I get paid for it?? I must have died and gone to heaven. I am so thankful and proud to work for Canine Adventure. Getting dogs tired and helping shelter dogs are two things I’m extremely passionate about and I love that I’m able to do that every single day thanks to this company. I’m Kevin. I grew up surrounded by dogs and cats on a small farm in Nelson County. I studied mechanical engineering at Virginia Tech while serving in the Marine Corps reserves. After graduating from Tech, I chose to work in Alexandria VA as a Patent Examiner. I reached my limit after nearly a decade and a half of sitting in an office. I felt burned out and in need of something different. Canine Adventure allows me to get back to the things that are most fulfilling to me… dogs and being outdoors. My pack includes two canines: a rescued Basset hound/retriever mix named Eliza; and a Chow-Chow mix named Rusty. I regularly take my dogs on nature hikes with me. I truly enjoy getting dogs outdoors and providing them with the freedom to explore their surroundings. I look forward to meeting and sharing many new adventures with some canine companions in the Charlottesville area. Hi, my name is Jean and I came to Canine Adventure in March 2018 after working with dogs for over ten years in veterinary clinics and at the SPCA. While I really enjoyed the medical side of working with dogs and I loved my work at the SPCA, I just wanted to do to more for them! One of the things that I learned about dogs from working at the SPCA is that most of them just need to have some fun and adventure in their lives, and so did I! Spending quality time with dogs outside exploring and learning is the perfect job for me. I love building relationships with dogs and their owners and look forward to many adventures ahead of me. While I am not walking dogs, I am taking care of my own pack of four mostly herding dogs on the small farm I share with my partner, four cats, two horses and a donkey. Hi, I'm Darius! I love being around dogs and enjoy being outdoors and hiking. While I'm not out and about in the city or in one of the parks, you can most likely find me at home on the couch. I am big into art, but I mainly stick to drawing, painting and graphic art. I'm looking forward to some fun adventures with all the dogs. Andy Kohler was born and raised in South Jersey. He studied music at the University of Tennessee, Knoxville. He currently resides on the Southside of Richmond with his wife, Emily, and his cat, Nona. He enjoys music, Phillies baseball and grilling in the backyard. Hello, I’m Anna! I have always gravitated towards dogs and the outdoors so I am thrilled to be a part of the Canine Adventure team! I am usually runnin’ with my dogs Miles, a dapper lil nine year old bugg (boston terrier pug mix) and Filly, a wild and beautiful rescue plott hound mix. We love exploring new spots in Richmond or escaping to the mountains or beach. If I am not with my dogs, I am likely in the darkroom developing pictures I took of them. I am looking forward to meeting more of the dogs of Richmond! Hi, I'm Kathleen!I grew up in Hanover County just north of Richmond and have always had an affinity for all things animal. Over the years I've had the sweetest, best, and wildest companions in dogs. Working with them is a dream come true! When I'm not out with doggos, I work as a caregiver and spend my free time watching nature documentaries, playing with my kitties, hanging out with friends, and trying new restaurants around town. Hey there! I'm Kristen and I am so excited to have the pleasure of taking your dogs on adventures. I'm a Virginia native and have worked in the human services field for the past 6 years but I've always been strongly drawn toward animals. I started volunteering at a local shelter over the summer, of course fell in love with the dogs, and I always looked forward to seeing their faces and helping in any way. Volunteering is what kickstarted my switch from working with humans to fur babies and I couldn't be happier for this opportunity! When not at work you can most likely find me cuddling my adorable dog Zoey, playing board games, or exploring the city to find the best sites and the yummiest vegan eats. Hi, I’m Ian. I love dogs and have spent countless hours hiking and going for walks around the city, so when I found out about Canine Adventure, I knew it would be the perfect job for me. I am grateful that I can exercise these passions while improving the lives of dogs and their families. I promise to always do my best to make your dogs’ days more joyful and carefree. I am also a part-time student at U of R and spend my free time reading, watching movies and hanging out with friends. Hi My name is Savannah S. I was born and raised in Hanover county then moved to the Chesterfield area my Sophomore year of high school. I have 3 angel fur babies- Hank, Molly, and Sadie. I also own a bunch of chickens and a turkey! I have worked with animals since I was 16. I have worked in multiple veterinary hospitals, pet resort, grooming salons, and even assisting in the animal control setting. I have always had a special place in my heart for all animals, but taking care of other people’s pets like my own and seeing their happy faces became a dream come true. I strive to make an impact on the dog’s experience and the owner’s for future walks and adventures! Hi my name is Karen Knarr! I relocated from Buffalo about 29 years ago and have been living in the Richmond area ever since. My very favorite thing to do is spend time with my wonderful rescue pup Homie, but I've been volunteering with RACC and the SPCA for many years and have a large place in my heart for all rescue animals. I enjoy going to the gym and spending time outside hiking and learning about new places. I'm also a vegetarian and love exploring new restaurants and food. Hey! I’m Teagan. I’ve lived in the Richmond area since I was ten and have grown up around dogs all my life. I’ve been in retail for 6 years and have been working at a dog boutique for almost 3 of those years. Working with dogs has to be the best part of my day and I am so excited to extend that time through Canine Adventure. In my free time, I enjoy exploring different restaurants around Richmond, playing board games with friends, and visiting family in Virginia Beach. Hey there! My name is Elyse. I moved to Richmond in the Spring of 2018 to pursue a career in human medicine. I had bounced all over the planet pursuing a career in animal medicine before this. From Maryland to Florida, Nebraska to Buffalo, back to Maryland and finally settling down in Richmond. This is my favorite city of them all, and one I plan to stay in. Although I enjoy my job and feel myself actively making a difference in the health field, I knew there was something missing. When you get to fill life's voids with animals, there's a sense of completeness and harmony that can only be described if you've lived that life. I seeked and I found Canine Adventure and could not be more excited to be a part of this company. I have a Bachelor's degree in both Biology and Veterinary Technology. I was a Vet Tech for over 2 years and have worked with every animal imaginable. Leaving town and leaving our favorite little fur babies can be super stressful. I'm here to alleviate that stress and give your pets all the world's love and care. Hi! I’m David! I’ve had dogs my whole life—dogs of all different sizes: a German Shepherd, a Saint Bernard, a Basset Hound, a Pomeranian, a Rat Terrier and a Shiba Inu. I love my job at Canine Adventure! When I’m not spending time with my dogs, I love spending time with yours. I love taking dogs on hikes along the James River or through Hollywood Cemetery. I enjoy taking them excursions around their neighborhoods and giving them the love and extra attention they need and deserve. I just moved to Richmond a few months ago and love exploring this city in my free time. In addition to Canine Adventure, I teach acting, directing and playwriting. I have had six plays published and dozens of plays produced around the country. My next goal is to train my owns dogs and turn them movie stars! Hey there! 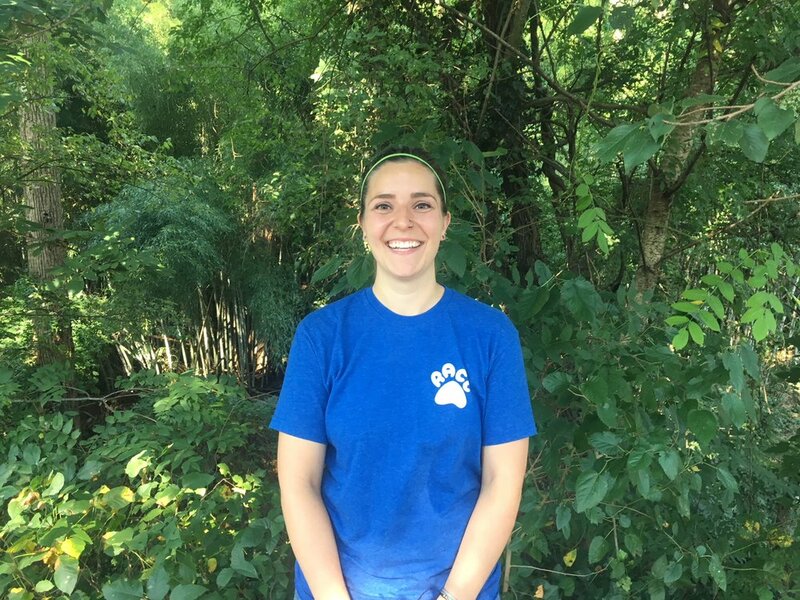 My name is Taylor, I have called Richmond home for about 10 years now, and I am so excited to be working with Canine Adventure! I look forward to bringing the enjoyment of healthy exercise and reinforcing good behavior with your pups! My favorite activity is spending time outside with dogs so naturally Canine Adventure, with their awesome reputation and great services like sponsored walks for shelter dogs, was a great fit. I enjoy continuously learning from and with all animals, and I am glad to be able to do so in our fair city! Outside of dog handling, I am a clinical herbalist for humans and pets, and when I’m not working I am enjoying time with my partner and our animals; Diego the dingo, our smitten kitten Bernadette, and our sweetie snake Sir Bonesaw Beat-Rice. I’ve been a dog lover my whole life but it took until my thirties to commit to being rooted in one place to having a dog of my own. Before that, I was everybody’s cool dog uncle. When I’m not walking my dog or someone else’s, I’m trying to balance creative endeavors (drawing & writing mostly) with climbing, cycling & rafting. It’s a lot, but it’s all better with dogs! I'm Nate! I moved to Richmond in December from Boston, Massachusetts where I also worked with dogs. I love Richmond so far and am certainly very pleased to be away from the New England winter! Working with dogs is great for me because it is both fun and challenging. I get to meet great new pups all the time and each dog helps me develop my skills a little bit more. My favorite part of working for Canine Adventure is the sponsored walk program which allows me to take shelter dogs out on adventure walks as part of my regular work day. Outside of my dog life I'm an avid long distance hiker. I've hiked numerous long distance hiking routes like the Appalachian Trail, Pacific Crest Trail, Continental Divide Trail, along with others. I've worked seasonally as a backcountry ranger in Maine and lead trail crews building hiking trails in Colorado. I'm also an artist and musician which explains why I spend a lot of time living in cities like Richmond. I'm an all around animal lover and hope to someday find work on a dog/farm animal/ or wildlife rescue. Hi! My name is Justin and I grew up in Philadelphia with my parents and our french bulldog (my sister) Emma. After graduating from the University of Richmond I decided to stay here in Richmond! In addition to working for Canine Adventure, I am also the assistant coach of the University of Richmond Men's Ultimate Frisbee team and am currently pursuing a masters in Coaching Education and Athlete development. If I am not coaching ultimate, I am probably playing or watching others play. Feel free to ask me to throw frisbees for some quality playtime and exercise with your dog! Hello hello! My name is Brianna and I joined Canine Adventure in February 2019 so that I could take my "Hi! Can I pet your dog?" hobby to the next level. I grew up near Albuquerque, New Mexico working with rescue horses and in the company of several rescue dogs and cats. Working with and being surrounded by animals has always been a priority in my life. The hardest of times were the two years I spent in college without a woofer to tell me if the noise was a house creak or a burglar! Now I ask Tuna and Ruca for bed-space privileges and life couldn't be sweeter. When I'm not baby-talking to our Canine Adventure clients, I'm painting, teaching earth science, camping, hiking, or horseback riding. Canine Adventure founder, Josh Rickey, adopted an abandoned dog during a climbing trip in West Virginia. Tied to a tree and left for dead, Josh decided to bring the dog home, whom he named Marshall. But Marshall didn’t like being left at home alone while Josh worked- and he showed it. He howled and barked all day while destroying everything within reach. Lunchtime walks helped, but it wasn’t until they started exploring the parks and rivers that things began to change. Because of their adventures together, a bond developed between the two and Marshall’s destructive behaviors started to fade. Friends started sending their dogs along for these “Adventure Walks” and touted the benefits, suggesting that Josh could turn these hikes into a business…and Canine Adventure was born!